Aline works mostly on site specific glass lighting commissions in collaboration with architects, interior- and lighting-designers. She also designs and produces exclusive kilnformed glass vessels and platters. Her inspiration comes from her rural retreats to Dorset. The fibrant palette of beach paraphernalia, seaside rock and windbreak patterns translate with ease into fused glass. 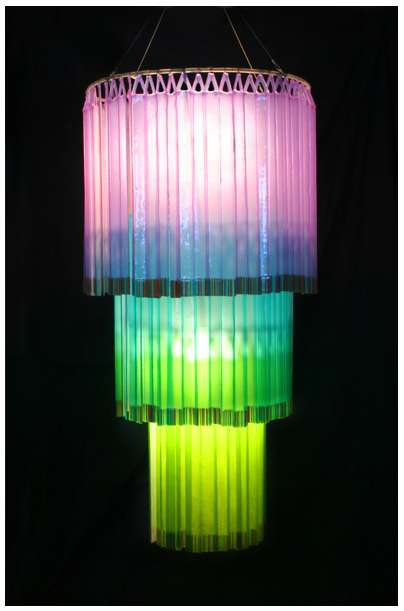 Her search is to find a balance in combining the medium glass with lights. To harness the translucent beauty of glass she casts found objects, e.g. feathers and leaves, to create chandeliers. The sparkling translucency, the fluidity and the everchanging colourpalette of the sea have immediate relevance to working with kilnformed glass and provide an infinite source of inspiration.